A chemical compound - new to science and never before identified - is being investigated by an ESF doctoral student who is working to replicate it so it can be tested as a weapon in the battle against disease-transmitting mosquitoes. Robert Moesch, who is one year into his doctoral studies in organic chemistry of natural products, said his work is focused on confirming the compound's structure and synthesizing it. "We talked about this compound before Zika was front-page news," he said, referring to the headline-grabbing virus that has been linked to birth defects. "There are a lot of other diseases transmitted by mosquitoes - the West Nile virus, dengue fever, yellow fever and malaria - that kill millions of people every year." His work is funded by the SRC Graduate Student Fellowship, which supports ESF graduate students pursuing advanced degrees in technical areas of major national and societal significance. It is one of more than 180 named scholarships administered by the ESF College Foundation, Inc., which provided nearly $1.5 million in scholarships to ESF students in 2015-16. Brenda Greenfield, executive director of the ESF College Foundation and ESF assistant vice president of development, said the foundation has a long tradition of working with alumni, friends and organizations to provide financial support for ESF students and academic programs. "One of the most important things we provide funding for is scholarships. Scholarship funding allows the best and brightest students to access an ESF education. With that strong educational background, our students go on to do great things in our world." Moesch's adviser, Dr. Francis Webster of the ESF Department of Chemistry, said the research project is unique to ESF. Webster got involved because of his long collaboration with an entomologist, Dr. Colby Schal of North Carolina State University had identified a chemical compound found in bodies of water - ranging from ponds to puddles to small pools that accumulate in manmade items - that were apparently attractive to female mosquitoes. "The female mosquitoes lay their eggs in some puddles and avoid others," Webster said. Webster's contribution was to determine the compound's chemical structure, which he did through the use of ESF's nuclear magnetic resonance spectrometer. For proprietary reasons, Webster does not discuss the name of the compound or its structure. He does, however, say it is probably derived from oak leaves, which are typically found in the water the mosquitoes choose for their eggs. "The presence of the oak leaves seems to signal to them: 'This is a good place to lay your eggs,'" he said. Moesch is spending the summer in Webster's lab, working to confirm the compound's structure and produce a synthetic version that Schal can test. "If we find it attracts females to certain bodies of water, we would create our own sources of water and put larvacides in it. The larvacides generally are not harmful to the environment but, obviously, they are quite harmful to larvae," Webster said. "And that would greatly reduce the number of mosquitoes. It's basic science but it's practical as well. This would be a novel way to control an insect pest, to get them to lay their eggs where we want them. It's much more typical to control insects by spraying insecticides across a broader area." 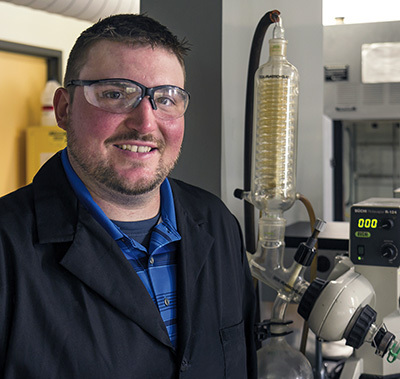 Moesch graduated from ESF with his bachelor's degree in 2011 and worked four years as a synthetic organic chemist with Alpha Scent, Inc., before returning to ESF as a graduate student. "The fellowship is a huge help because I don't have much other support, besides my work as a teaching assistant," he said. "It helps me to pay my rent and buy food and do all those other things I need to do to stay alive." ESF was a natural fit when he decided to continue his education. "There are a lot of selling points for ESF. I like the very specific academic focus in the chemistry department. And I really liked the social aspect of being able to participate in all the activities at Syracuse University."